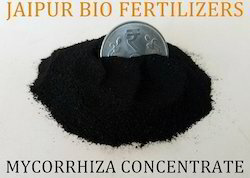 Manufacturer of a wide range of products which include mycorrihiza concentrate, vam, mycorrihiza powder, mycorrihiza technical, vesicular arbuscular mycorrhizae and mycorrhiza liquid. Vesicular Arbuscular Mycorrhiza follows culture based on American Technology. VAM is a symbiotic endophytic soil fungus, which colonizes the roots of approximately 80% plants. VAM fungi produce hyphae, which are microscopic tubes that colonize crop roots and grow out into the soil further than root hairs. Nutrients are taken up by the hyphae and carried back to the plant. This results in very efficient mobilization & uptake of fertilizers and other nutrients by plants. Our product surpasses all VAM technologies available in the market because of our in house developed special product which helps to increase the results. 2. Culture based advanced American Technology being followed for bulk production. 3. Long shelf life and wide ecological acceptance. nitrogen, phosphorous, iron, zinc, sulfur and copper. It resists entry of pathogens and nematodes near plant roots. It increases the surface area of roots from 100 to 1000 times. Enhances uptake of applied fertilizer Nitrogen. It also improves biological Nitrogen fixation of legume by improving nodules formation. Creates resistance to entry of pathogens and controls the population of rhizosphere microorganisms. Reduces symptoms incited by disease producing organisms. Significantly lowers need of watering and fertilizer. Fungi penetrate roots and also extend beyond the roots to absorb water and nutrients and deliver them to the plant roots. The filaments bind and aggregate soil particles. Colonies of fungi penetrate the cortical cells of roots of vascular plants and also extend far into the soil to absorb water and nutrients and deliver them directly from soil to the plant roots. Fungi excrete compounds that stimulate the plant to produce additional roots on which fungi can grow. The filaments of fungi retain moisture to bind and aggregate soil particles to improve physical soil conditions for more water infiltration, decreased surface run-off and increased water holding capacity. It can be used for all Plants and Crops. IP / gm. or IP / ml. Ready to use Powder Formulation with organic growing elements like Humates, Fulvates, Kelp Extracts, Amino acids, Vitamins, Bio-enhancing agents etc. Vesicular Arbuscular Mycorrhiza follows culture based on American Technology.VAM is a symbiotic endophytic soil fungus, which colonizes the roots of approximately 80% plants.VAM fungi produce hyphae, which are microscopic tubes that colonize crop roots and grow out into the soil further than root hairs. Nutrients are taken up by the hyphae and carried back to the plant. 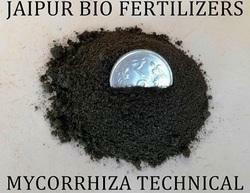 This results in very efficient mobilization & uptake of fertilizers and other nutrients by plants. Vesicular Arbuscular Mycorrhiza follows culture based on American Technology. VAM is a symbiotic endophytic soil fungus, which colonizes the roots of approximately 80% plants.VAM fungi produce hyphae, which are microscopic tubes that colonize crop roots and grow out into the soil further than root hairs. Nutrients are taken up by the hyphae and carriedback to the plant. This results in very efficient mobilization & uptake of fertilizers and other nutrients by plants. Mycorrhizae are obligate and saprophytic in nature requires a living host for their survival.Commonly divided into three major groups Ectomycorrhiza, Endomycorrhiza and Ectendomycorrhiza. Ectomycorrhiza and Endomycorrhiza are important in agriculture, fungi penetrate into the plant cells, producing balloon like vesicles. The structure of the arbuscules increase the contact surface between the hyphal and the cell cytoplasm to facilitate the transfer of nutrients between them and VAM fungi produce the glycoprotein glomalin which may be one of the major stores of carbon in the soil, management of VAM fungi enhances phosphate uptake and mobilize immobile micronutrients like Fe, Mn, Zn, Cu, Bo, Mo. Besides these to impart resistance to plant against drought, soil borne fungal pathogens and nematodes.There is no septum in their hyphae. The fungi hyphae penetrate in to cortex layer of the root and form the hyphal organ “vesicles” and “arbusculus”. The interaction between AM fungi and plants is generally mutualism based upon nutrient exchange. Cereals, Pulses, Oil seeds, Fruits, Vegetables, Plantation, Fiber crops, Forest and Nursery. Soil Treatment – Mix 4 kg per acre in 50 Kg of well decomposed Fym/compost/vermi compost/field soil and incorporate in the soil before sowing/transplant. Broadcast the above mixture in standing crop 25-30 days after sowing. To get better result do not mix with chemical fungicides and agrochemicals for storage and field application. Mycorrhiza helps in root development & profuse root branching as a consequences water & nutrient availability to crop increase (Drought resistant & healthy growth). Protect plants from many of soil borne infections, salinity & acidic shock, Increases uptake of P, k, Mg, Micronutrients etc. All the factors help in total crop yield enhancement more than 30 %. Mycorrhiza Liquid have advantages of application on field, use the content directly on drip or for seed coating or may mix with fertilized for suitable application. Mycorrhizal Spores on getting signal from root exudate germinate to produce mycelia & penetrate the root cortex where, they developed arbuscules & vesicle. Vesicle is the storage organ & Arbuscule is branched tree like structure responsible for uptake of sugar from plant & provide water & nutrients to plant.Fungi penetrate roots and also extent beyond the roots to absorb water and nutrients and deliver them to the plant roots. The filament binds and aggregate soil particles. Apply 400ml.-500ml. per Acre of seeds to be sown (10 KG), sprinkle uniformly over seeds so as a thin layer is coated upon; mix the seeds by using gunny bags or suitable clean cloth (non-absorbent). Allow to dry the coated seeds under shed and use them for sowing on the land. This process is applicable with seeds like paddy, wheat, sorghum, corn, ground nut, tuver, mung, chowli, guar, soybean etc For Sets like Potato, Banana, Sugarcane etc., Dissolve 400ml.-500ml. 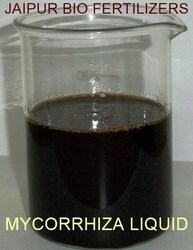 of Mycorrhiza Liquid in 5 Litre of water. Sprinkle uniformly using gunny bags or suitable clean cloth. Use the coated sets for sowing purpose. Apply 400ml.-500ml. of Mycorrhiza Liquid on nursery bed prepared for crops sown for 1 acre area (Generally 5 square meter area is used for sowing nursery crops of 1 Acre) At the time of transplantation, prepare bunches of crops to be transplanted and dip in Mycorrhiza Liquid for 2-5 minutes and immediately transplant the crop on the field. This method is applicable to various crops like paddy, cotton, tomato, chili, onion etc. Application on to the Land:Apply 400ml. to 500ml. per acre at the time of sowing. Add 400ml.-500ml. of Mycorrhiza Liquid in 5-10 Liters of water and mix properly with 20-30 KGS of Farm Yard Manure or Organic Compost or Vermi Compost and sprinkle over the land. Add 400ml.-500ml. of Mycorrhiza Liquid in 200 Litre of water and apply by drip irrigation per acre. For Flowers and Horticultural Crops, treat the transplants by root dip method or by cutting method. nutrients such as organic N, P, Fe, Zn, Sulfur and copper. • It works on all Plants and Crops. • It resists entry of pathogens and nematodes near plant roots. • It increases the surface area of roots from 100 to 1000 times. • Enhances uptake of applied fertilizer Nitrogen. • Significantly lowers need of watering and fertilizer. All cash crops, Paddy, Sugarcane, Groundnut, Potato, Wheat, Cotton, Fruit crops, Banana, Mango, Pomegranate, Vegetables, Onion, Garlic, Tomato, Garden & nursery plants, turfs & Ornamental plants etc. Mycorrhiza is Greek word it means “fungus+ root” Mycorrhiza form symbiotic association with plant that colonizes the cortical tissue of roots during periods of active plant growth. These symbioses are characterized by movement of nutrients - carbon flows to the fungus and inorganic nutrients move to the plant, thereby providing a critical linkage between the plant root and soil. Mycorrhiza Powder contains Biostimulants, Herbal extract & extracts of compost in order to promote the product efficiency. Mycorrhiza helps in root development & profuse root branching as a consequences water & nutrient availability to crop increase (Drought resistant & healthy growth). Protect plants from many of soil borne infections, Reduces transplantation, salinity & acidic shock, Increases uptake of P, k, Mg, Micronutrients etc. All the factors help in total crop yield enhancement more than 30 %. Mycorrhizal Spores on getting signal from root exudate germinate to produce mycelia & penetrate the root cortex where, they developed arbuscules & vesicle. Vesicle is the storage organ & Arbuscule is branched tree like structure responsible for uptake of sugar from plant & provide water & nutrients to plant. APPLICATION TIME: At the time of seed sowing or at early stages of crop development to get best result. SHELF LIFE: Root-Care is stable for period of 24 month from the date of manufacturing. Looking for VAM Mycorrihiza ?